Alizadeh, M., Jenabali-Jahromi, S. (2010). A simple Analytical model for solidification cooling rate based on the local heat flux density. International Journal of Iron & Steel Society of Iran, 7(2), 34-44. M. Alizadeh; S. Jenabali-Jahromi. "A simple Analytical model for solidification cooling rate based on the local heat flux density". 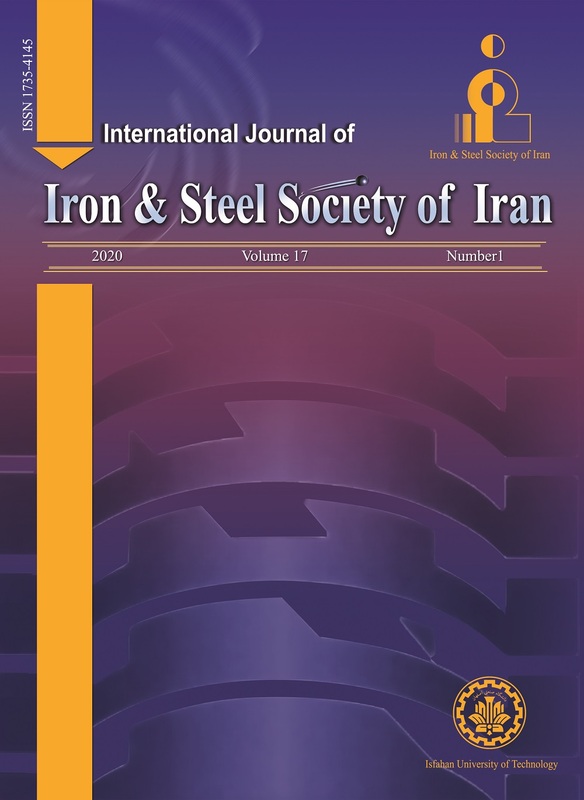 International Journal of Iron & Steel Society of Iran, 7, 2, 2010, 34-44. Alizadeh, M., Jenabali-Jahromi, S. (2010). 'A simple Analytical model for solidification cooling rate based on the local heat flux density', International Journal of Iron & Steel Society of Iran, 7(2), pp. 34-44. Alizadeh, M., Jenabali-Jahromi, S. A simple Analytical model for solidification cooling rate based on the local heat flux density. International Journal of Iron & Steel Society of Iran, 2010; 7(2): 34-44. 1Department of Metals, International Center for Science, High Technology & Environmental Sciences,Kerman,Iran. 2Science and Engineering, Shiraz University, Shiraz, Iran. A new simple analytical model for prediction of cooling rate in the solidification process based on the local heat flux density extracted during solidification is introduced. In the modeling procedure, a solidifying control volume is considered in the mushy zone in which a heat balance equation is used to derive the present model. As the local heat flux density is a measurable parameter, the present model can be used directly on a production line. The present model was validated with numerical method and well adopted with analytical model of Garcia et al. The validation depicted that the present model can predict the cooling rate during solidification process with the same accuracy of the numerical method and Garcia’s model. Moreover, it was shown that the present model can be used to calculate the average and local cooling rate, where the available models face some difficulties. Z. Ma, E. Samuel, A.M.A. Mohamed, A.M. Samuel, F.H. Samuel and H.W. Doty: Mater. Des., 31 (2010), 902. Z. Li, H. Zhong, Q. Sun, Z. Xu and Q. Zhai: Mater. Sci. Eng., A 506 (2009), 191. M. Rajabi, M. Vahidi, A. Simchi and P. Davami: Mater. Charact., 60 (2009), 1370. Z. Tang and W. Stumpf: Mater. Sci. Eng. A., 490 (2008), 391. R.J. Zhang, Z. He, Y. Wang and W.Q. Jie: J. Mater. Sci., 39 (2004), 6379. D. G. Eskin and L.K. Suyitno: Prog. Mater. Sci., 49 (2004), 629. M. Rappaz and W.J. Boettinger; Acta Mater., 47 (1999), 3205. K.H. Kim, H.N. Han, T.J. Yeo, Y.G. Lee, K.H. Oh and D.N. Lee: in Melt Spinning, Strip Casting and Slab Casting, TMS Annual meeting, Anaheim California, Feb. 4–8 (1996), 87. H. D. Brody and M. C. Flemings: Trans. Metall. Soc. AIME, 236 (1966), 615. A. Yazdipour, A. Shafiei M and K. Dehghani: Mater. Sci. Eng., A. 27 (2009), 192. F. Qiu, P. Shen, T. Liu, D. Zhang and Q. Jiang: J. Alloys Compd., 477 (2009), 840. S. Bontha, N. W. Klingbeil, P. A. Kobryn and H. L. Fraser: J. Mater. Process. Technol., 178 (2006), 135. F. Sá, O. L. Rocha, C. A. Siqueira and A. Garcia: Mater. Sci. Eng., A. 373 (2004), 131. C.A, Muojekwu, I.V. Samarasekera and J.K. Brimacombe: Metall. Mater. Trans., B 26 (1995), 361. H.S. Kim, Y. Kobayashi, S. Tsukamoto and K. Nagai: Mater. Sci. Eng., A 403 (2005), 311. M.F. Zhu, C.P. Hong, D.M. Stefanescu and Y.A. Chang: Metall. Mater. Trans. B, 38 (2007), 517. G. A. Santos, C. M. Neto, W. R. Oso´rio and A. Garcia: Mater. Des., 28 (2007), 2425. W. R. Oso´rio and A. Garcia: Mater. Sci. Eng., A 325 (2002), 103. O. L. Rocha, C. A. Siqueira and A. Garcia: Mater. Sci. Eng., A 361 (2003), 111. T. Emi and H. Fredriksson: Mater. Sci. Eng., A 413-414 (2005), 2. M. Alizadeh, A. Jenabali Jahromi and O. Abouali: Comput. Mater. Sci., 44 (2008), 807. T.A. Blase, Z.X. Guo, Z. Shi, K. Long and W.G. Hopkins: Mater. Sci. Eng., A 365 (2004), 318. C.A.Santos, J.A.Spim, M.C.F.Ierardi and A. Garcia: Appl. Math. Model., 26 (2002), 1077. S. Louhenkilpi, J. Miettinen and L. Holappa: ISIJ Int., 46 (2006), 914. S. Qiu, H. Liu, S. Peng and Y. Gan: ISIJ Int., 44 (2004), 1376. H. Wang, G. Li, Y. Lei, Y. Zhao, Q. Dai and J. Wang: ISIJ Int., 45 (2005), 1291. R. A. Hardin, K. Liu, A. Kapoor and C. Beckermann: Metall. Mater. Trans., B 34 (2003), 297. G.H. Geiger and D.R. Poirier: Transport phenomena in metallurgy, Addison-Wesley, United States of America, (1973). Y. Meng and B.G. Thomas: Metall. Mater. Trans., B 34 (2003), 707. W. Kurz and D. J Fisher: Fundamentals of Solidification, Trans Tech, Switzerland, (1986). A.M. Mullis: J. Mater. Sci., 38 (2003), 2517. C.A. Santos, J.A. Spim and A. Garcia: Eng. Appl. Artif. Intell., 16 (2003), 511.